After a long time, Samsung has changed its smartphone design basis and first ‘Redesigned’ Phone from the Asian manufacturers is now Official. Samsung announced today its metal clad smartphone, Samsung Galaxy Alpha and yes, it looks like an iPhone! This phone had been rumored for sometime now with leaks showing its metal sides. Lets focus on the new design first. Samsung is calling their Galaxy Alpha "the evolution of Galaxy Design." This evolution is basically making the body metal with chamfered edges, instead of ‘typical Galaxy’ curves, much like the iPhone designs and the latest Xiaomi MI4. This might be the start of Samsung’s redesigning of its devices specially after a sharp drop in profits. The Galaxy Note 4 will tell us more about how Samsung’s future devices might look like. Coming to Specs, Galaxy Alpha is a toned down version of Galaxy S5 with an mediocre 4.7” 720p display but nonetheless wieldy. Under the hood, you will find an Octa-Core Processor (likely an Exynos 5 with quad 1.8GHz + quad 1.3GHz) and 2 GB of RAM. Cameras are up there with the best with a 12 MP rear shooter with 4K video recording and a 2 MP selfie camera. The Biggest turn off of this phone is its battery. At a mere 1860 mAh., you will find this phone showing low battery almost every 12 hours. 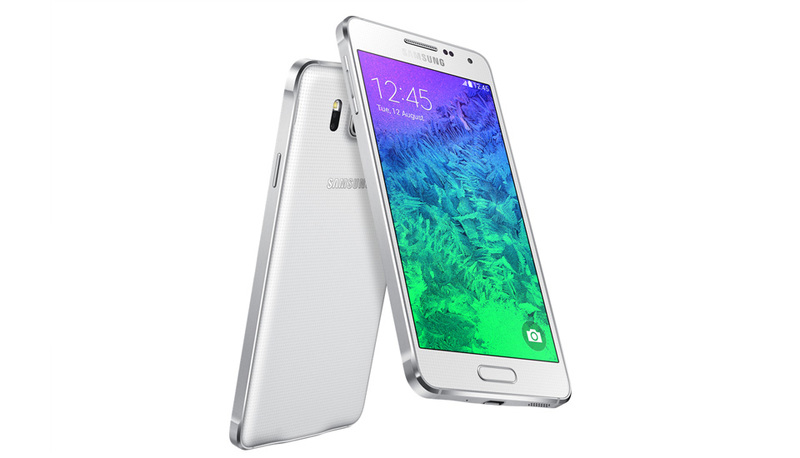 Samsung Galaxy Alpha will arrive in September in black, white, gold, silver and blue colors. Watch the Galaxy Alpha Official Video here.